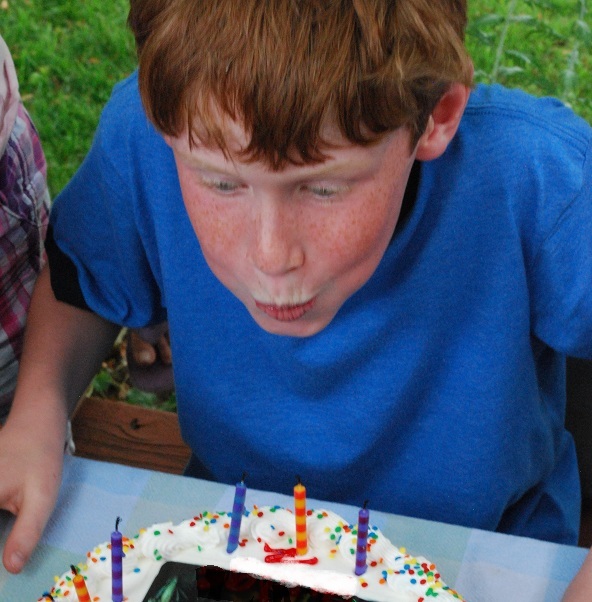 Luckily, Boy 1 is easy to please, so his party consisted of pizza, games, cake, more games, smores and more games. To transport his "party" to its location, we packed it all up in this big gardening bag from IKEA. Soda, smores fixin's, paper plates, cups, napkins, glo sticks, favors, and other party essentials all in one convenient bag. It sure looks festive, no? Love the fact that he is old enough now that he and his friends can entertain themselves at a party. It's amazing to watch my kids grow and enter new phases, and I think this phase is a lot of fun. Such fun to see how they interact! I sure will miss this great group of friends Boy 1 had in our old neighborhood...here's to finding another group of great friends in our new neighborhood. Happy Birthday to my 11-year-old! Love you!! I hope that somebody today has told you how terrific you are. Thanks for always being so inspiring. Happy birthday to your little boy. We have a birthday boy here too, my youngest boy turned 3 today.Good luck with the move, all the stress will be worth it when you get to the new house. Boys are so much fun! This looks like a great birthday party! Happy birthday to son!!!!! What a fun celebration and I just know he will make great new friends in the new neighborhood!